What Causes Paint to Peel? So you just finished painting your room and it looks great! A few months later, however, the paint is starting to peel and come off certain areas of the walls and trim. You thought you did a great job painting, and you’re confused as to what went wrong. 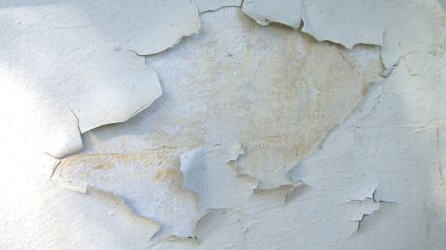 To help you solve your peeling paint dilemma, read about the 3 main causes of peeling paint below. Paint peels when it fails to adhere properly to the existing finish. If the wall has not been properly cleaned of dirt or other substances, the paint is not going to create a solid bond to the drywall. Make sure you lightly sand and wash the walls prior to beginning any painting project. Furthermore, apply a quality primer, such as Benjamin Moore’s Fresh Start, to prepare your walls and trim for the new coat of paint. Moisture is one of a painter’s worst enemies. If the surface upon which you apply paint isn’t completely dry, the paint cannot properly bond to the surface. This can create bubbles under the paint that will eventually lead to peeling. Even trace amounts of moisture can affect the adhesion of paints and penetration of stains. Thus, make sure that any surfaces you are finishing are completely dry before you begin work. If you purchase a new paint that is not the same type as what has already been placed on the walls, you’re asking for trouble. Whether it’s oil, latex or water based, paints of different types don’t usually mix well. If you have to use a different type of paint on top of another one, ask your local home improvement expert for a good primer that will help with the situation. Another common reason paint can peel is if the paint itself is simply poor quality. Cheap paint is cheap for a reason. It may be able to dry properly if it is the only layer on the wall, but it may lack the adhesive needed to stick on top of other layers of paint. All of the problems listed above can be easily avoided if the painter simply takes a little extra time to assess the situation and prepare prior to starting the paint job. Another way to ensure these problems don’t occur is to simply hire someone else to do it for you. If you’re in doubt of your abilities, hiring an expert may be the best solution in the long run.